The problem with treating moss is the black mess you’re left with that needs raking out, leaving bare patches which will need seeding. There is an alternative: MO Bacter is an organic fertiliser and moss treatment that causes the moss to ingest itself so it leaves no black debris to rake out. The late spring in many parts of the country has seen slow grass growth and whereas in other years mowing would have already begun it’s only now many of us are making the first cut. The simple rules are mow as the grass dictates and the higher the height of cut, the healthier the grass will be. Set the tractor deck or mower on the higher notch for the first cuts and lower gradually as the ground warms up. Towards the middle of the month consider applying a fertiliser if you haven’t already treated with a product such as Evergreen. You don’t want a fertiliser with high levels of Nitrogen. Over 36% nitrogen will encourage excessive leaf growth and a lot more mowing as a result. Water in granular fertiliser if there’s no rain to do it for you, and using a ready mixed product will help ensure the right balance of chemicals. 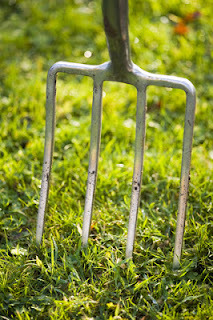 Overseed areas of the lawn that have become bare or sparse, or where you have raked out moss and thatch, using a suitable grass seed. If you have trees overhanging the lawn there are grass seeds for shady places.